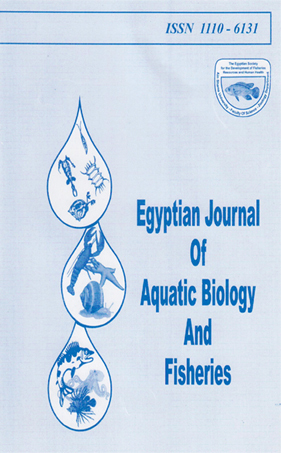 The aim of this experiment was to investigate the effect of aflatoxin B (AFB) in the diets of Nile tilapia (Oreochromis niloticus) and to examine the detoxification activity of a commercial anti-mycotoxin ARCAVIT® Bioacid Forte . The experimental period lasted 70 days during September - December 2018. Sixty fish were chosen with an average initial weight of about 40 g then randomly distributed into three treatments in six glass aquaria (30 × 60 × 40 cm); each treatment was applied in two aquaria (replicates). Dietary AFB was added at a concentration of 5 ng / g diet. The anti-mycotoxin ARCAVIT® (pro- and prebiotics) is one of the commercial anti-mycotoxins in the local market. It is the first test for it in aquaculture, which was added at a concentration of 0.5 g/Kg diet. The experimental diets of the three treatments were; the control treatment (T1): the basal diet (BD) without any additives. The second treatment (T2): BD with an addition of 5 ng AFB / g diet. The third treatment (T3): BD with an addition of 5 ng AFB / g diet and 0.5g ARCAVIT® / Kg diet. Fish fed the experimental diets at a daily rate of 3% of their live body weight, at two meals. The obtained results showed that AFB is very toxic, even at a low concentration as 5 ng / g diet, for Nile tilapia. It threats fish morphology, gross pathology, liver histology, growth performance, and internal organs indices, feed utilization, body composition, and properties, as well as hematological and plasma biochemistry parameters. Moreover, the anti-toxic agent (ARCAVIT®) at the tested level did not completely overcome the aflatoxicity symptoms. That leads to keep the old wisdom "Prophylaxis is better than cure".